The LAVASynC E is the second generation of our SimulCharge adapters and is designed specifically for USB-C type Samsung mobile phones and tablets. This adapter provides a complete connectivity solution by using our custom SynC™ technology to simultaneously charge and support data while they are connected to a mobile phone or tablet. 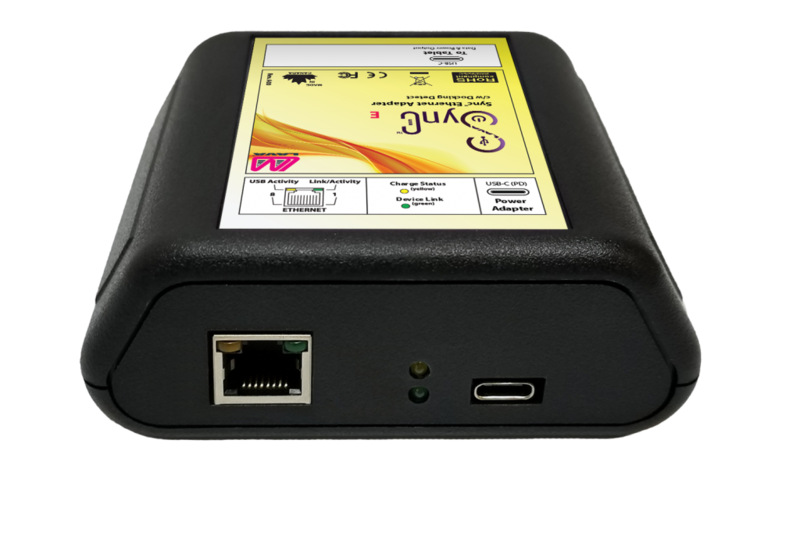 Features Ethernet connectivity, and Docking Detect add-on that enables automatic connection between the LAVA board and the device. Available with an optional built-in voltage converter. Allows an external 9 V up to 36 V DC power supply to be placed up to 50 feet away from the tablet. To order, please call +1 800 241 5282 or contact us HERE for availability. The LAVASynC E operate a mobile device in SynC mode. This technology allows the charging of the select USB-C type mobile phones and tablets while interacting with USB accessories. 10/100 Fast Ethernet interface enhances the reliability and the security of the internet connection. The Docking Detect feature ensures that when the adapter is plugged into the mobile phone or tablet, the mobile device recognizes that the adapter is present. This feature is a re-imagined form of Plug ‘N Play; when the mobile solution, the mobile phone and tablet along with the adapter, is plugged into or out of power, the mobile device will know. ➤ Powered by a standard USB Charger/Power Supply through a Micro USB-C receptacle. Power Supply: USB Charger/Power Supply with a USB-C connector, such as the power supply provided with the mobile device. Any regulated 5 volt power supply capable of at least 2 amperes can be used. The LAVASync board is ideal for applications where a mobile device needs power and the ability to support USB accessories in a situation when power sequences cannot always be followed. If you intend to plug your mobile solution in and out of power often, this board will meet your installation requirements. 1 x USB-C to USB-C cable (up to 6.6 ft/2 m) to the mobile phone or tablet. Note: The cable is not included. © 2019 LAVA Computers MFG Inc. All Rights Reserved.